Larry at Bleepingcomputer wrote: "Locky is back and currently being heavily distributed worldwide. While Locky was at one point considered the largest distributed ransomware, over time it became much more common to see other ransomware such as Cerber, Spora, and now even GlobeImposter. While it is too soon to tell if this is just another brief surge or an attempt to become a large player again, what we do know is that this particular campaign is strong with a wide distribution." 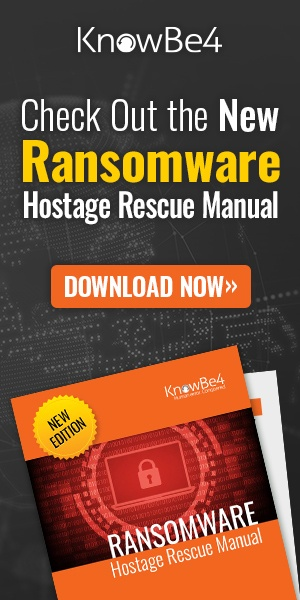 Report: "Ransomware Attack Downtime, Not Ransom Demand, is the Business Killer"
I have been saying this here for the last few years, and I am encouraged to see it now confirmed by a new survey from our friends at Malwarebytes. They released their “Second Annual State of Ransomware Report”, and the study surveyed 1,054 companies with less than 1,000 employees across North America, France, U.K., Germany, Australia, and Singapore. The report, conducted by Osterman Research, explores ransomware attack frequency, impacts of attacks in SMB environments, costs of attacks, attitudes towards ransom payments, preparedness and more. Survey results found that more than one-third of businesses have experienced a ransomware attack in the last year. Twenty-two percent of these impacted businesses had to cease operations immediately. “Businesses of all sizes are increasingly at risk for ransomware attacks,” said Marcin Kleczynski, CEO, Malwarebytes. “However, the stakes of a single attack for a small business are far different from the stakes of a single attack for a large enterprise. Osterman’s findings demonstrate that SMBs are suffering in the wake of attacks, to the point where they must cease business operations. Cyber-attacks were up by a quarter in Q2 2017, with a surprising twist: global manufacturing is now the top target. The report from NTT Security also shows that phishing is still the most popular threat vector, two-thirds (67%) of attacks came in the form of just such a threat. NTT is a very large global managed security provider, and they came out with: "Global Threat Intelligence Center (GTIC) Quarterly Threat Intelligence Report" showing there was a 24% increase in attacks on its worldwide customer base in the period of April to June, with a third (34%) of all attacks targeting manufacturers. This data actually gets confirmed by Verizon, who claimed in their recent Data Breach Investigations Report 2017 that phishing attacks were way up from the previous reporting period. The tactic of embedding malicious VBA macros into documents sent via phishing emails was particularly popular. Public-facing Microsoft SQL (MSSQL) servers were popular targets for brute-forcing. “The motivations for these attacks are often criminal in nature, including extortion via ransomware, industrial espionage, and theft of data such as account numbers,” said Jon Heimerl, manager of NTT Security’s Threat Intelligence Communication Team. Find out Which User's Passwords Are Weak for a Chance to Win! Are your user’s passwords…P@ssw0rd? Verizon's recent Data Breach Report showed that 81% of hacking-related breaches used either stolen and/or weak passwords. Employees are the weakest link in your network security. KnowBe4's Weak Password Test checks your Active Directory for 10 different types of weak password related threats and reports any fails so that you can take action. Plus, you’ll be entered to win a Nintendo Switch! Also, EVERYONE in the US/Canada will receive a real Kevin Mitnick collectible stainless-steel lock-pick business card! This will take you 5 minutes and may give you some insights you never expected. Researchers at FireEye posted that they uncovered a malicious document sent in spear phishing emails to multiple companies in the hospitality industry, including hotels in at least seven European countries and one Middle Eastern country in early July. Successful execution of the macro within the malicious document results in the installation of APT28’s signature GameFish malware. As soon as GameFish is successfully installed, it takes advantage of EternalBlue to worm its way into the network and compromises personal computers used for controlling both guest and and internal Wi-Fi networks. Once in control of these machines, the malware deploys an open source Responder tool, allowing it to steal any credentials sent over the wireless network. "This is the first time we have seen APT28 incorporate this exploit into their intrusions, and as far as we believe, the variant used was based on the public version," Cristiana Brafman Kittner, senior analyst at FireEye, told ZDNet. FireEye warns that publicly accessible Wi-Fi networks present a significant threat and "should be avoided when possible". With the public release of the EternalBlue exploit, it's not surprising that hacking groups are looking to harness that and other Vault7 leaks for their own gain. It's an epic fail that the American intelligence community lost control of this toolkit and let the genie out of the box. For C-level execs that need to do a lot of travel, I recommend an iPad Pro, with its own cell-phone number, and use VPN to connect to any remote servers. I would tell them to avoid Wi-Fi on the road all together. Also, never run any software updates while traveling. I have successfully used this setup for a few years now. It's a must these days to send all employees simulated phishing attacks with Office attachments that have macros and see if they open that document and click on "Enable Editing". If they do, that means a social engineering failure and they need to get some remedial training immediately. Also, give them access to the KnowBe4 complimentary Phish Alert Button so that they can forward phishy emails to your Incident Response team. When new spear phishing campaigns hit your organization, it is vital that IT staff be alerted immediately. One of the easiest ways to convert your employees from potential targets and victims into allies and partners in the fight against cybercrime is to roll out KnowBe4's complimentary Phish Alert Button to your employees' desktops. Once installed, the Phish Alert Button allows your users to sound the alarm as a last line of defense when suspicious and potentially dangerous phishing emails slip past all the other layers of protection your organization relies on to keep the bad guys at bay. While Mamba isn't a particularly common form of ransomware, it claimed a high-profile victim in the form of the San Francisco Municipal Transportation Agency in November last year. The attack forced the SFMTA operators to temporarily open the gates of ticket barriers and allow passengers to travel on the trains for no charge in order to minimise disruption. Unlike other forms of ransomware which usually have a set ransom, the attackers behind Mamba alter their demand depending on the number of systems infected. "That firewall won't mean much if your users are tricked into clicking on a malicious link they think came from a Facebook friend or LinkedIn connection. Here's what you need to know to protect your organization and your users. The state of Illinois, which has taken pioneering strides with various blockchain projects in testing new Internet technology, is taking additional steps to improve cybersecurity at its first line of defense: with end users. On Monday, Aug. 7, Gov. Bruce Rauner signed House Bill 2371, an amendment to the state’s Data Security on State Computers Act requiring annual cybersecurity training from the Department of Innovation and Technology (DoIT) for state employees. And proof that this is needed comes from the OCR, which tells organizations to step up phishing scam awareness, because employees still falling for email schemes, leading to more breaches. "Employees are still falling for phishing scams that are leading to major breaches, including those related to ransomware attacks such as WannaCry, say federal regulators who are urging healthcare entities to step up their workforce training and awareness of email schemes. In its latest monthly cybersecurity email newsletter, the Department of Health and Human Services notes that a 2017 study by consulting firm KPMG found a 10 percent increase over the past two years in the number of healthcare providers and health plans that have had instances of security-related HIPAA violations or cyberattacks impacting protected health information." Phishing, however, is a favorite vehicle of hackers launching attacks that are increasingly resulting in breaches of PHI, OCR says.